These remarkable Adastra aerial photographs come from the collection of Madeline and Warren Ide. Madeline was a photographic processor and printer with Adastra from 1966 until 1976 while Warren was a photogrammetrist with Adastra from 1956 until 1976. The majority of the photographs were taken before Warren joined the company and he has no record of why or for whom they were taken. 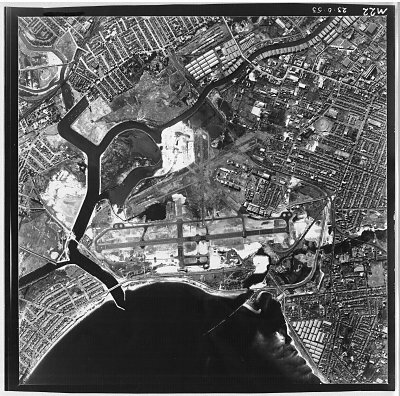 Although Sydney Airport features prominently in these photographs, it seems likely that the primary subject of all but two of them was the nearby Cooks River. 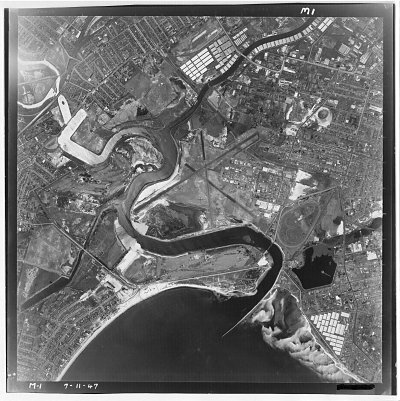 It is probably no coincidence that a works programme to free up more land for Sydney Airport by redirecting Cooks River took place from 1947 until 1953. 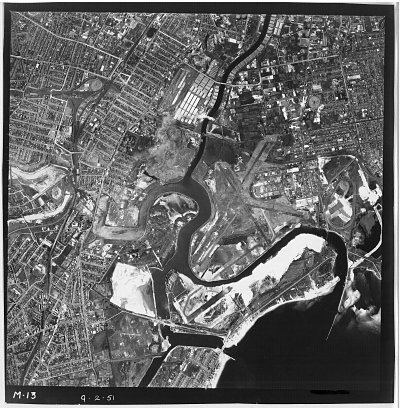 In 1946, the Cooks River Improvement Act was passed, its primary aim being to control flows and prevent degradation of the banks. It gave control of the lower reaches of Cooks River (from Tempe to Canterbury Road) to the NSW Public Works Department for flood mitigation and river diversion works. The river was dredged, “swamps” were reclaimed, and the banks of the lower river were strengthened with iron sheet piling. These works reduced dry weather flow, but, conversely, during wet weather, they caused major flood damage. “The solutions chosen for the river’s problems were engineering ones which had the effect of providing a more efficient stormwater drain for the urbanised Cooks River Valley”. 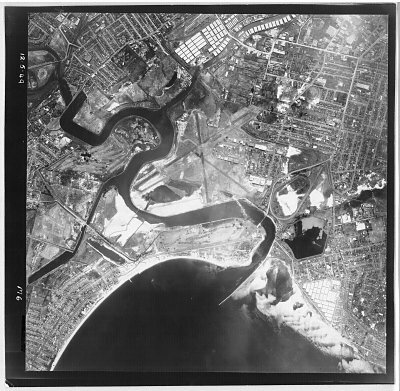 Between 1947 and 1955, the Alexandra Canal and lower reaches of the river were diverted 1.6 kilometres west of the natural outlet to allow for the reclamation of the large mangrove and saltmarsh basin at the mouth of Cooks River to enlarge Sydney Airport. This area had been relatively isolated from development, and the tidal flats “were the summer home of great numbers of migrating waders, from their far northern breeding grounds”. The works “embraced old works and landmarks closely associated with the early history of Sydney’s water supply and sewerage, including the pump-house and adjacent supply ponds for the Botany Swamps water supply, and the sites of the one-time Botany and Rockdale sewage farms”. 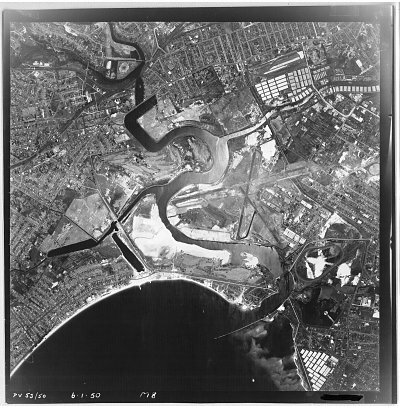 Therefore, it would seem that the sequence of photographs from 1946 to 1953 was taken for the New South Wales Public Works Department to record the progress of the redirection of Cooks River. It is known that Adastra had only Eagle IX cameras during the fifties and Warren recognises the Eagle IX format in these photographs. 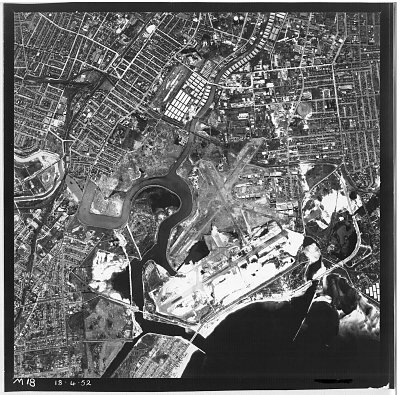 The Eagle IX had a nominal focal length of 6 inches and by comparing their scale with the Sydney street directory, he was able to calculate that they were all flown at approximately 9 000 feet. The 1969 photograph may have been taken to record progress on the construction of Sydney's new International Terminal which was opened in 1970. The construction site is the light area at top left. 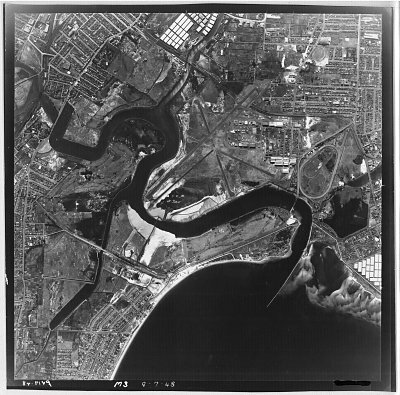 The reason for the 1975 photograph is less clear although it appears to show reclamation work adjacent to the existing Runway 16/34 which projects into Botany Bay. A parallel Runway 16L/34R now exists on this site but it was not opened until 1992. 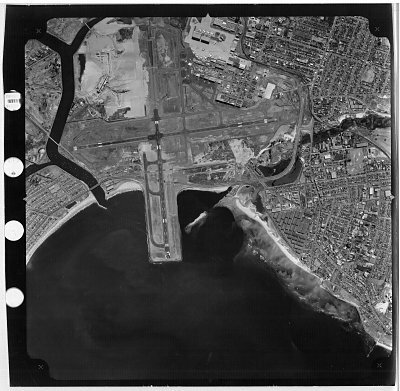 Warren believes that the 1969 and 1975 photographs were taken with a Wild RC8 camera fitted with a 6 inch (152mm) lens and also flown at 9 000 feet. 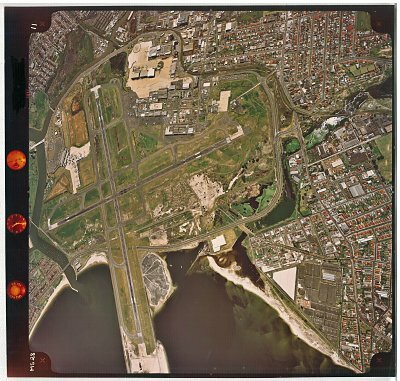 So, while these photographs may have been taken for different reasons, they provide a very useful chronological overview of the development of Sydney (Kingsford Smith) Airport. If any reader can shed further light on these photographs, please contact the webmaster. Similarly, if any reader can fill any gaps in the sequence we will be very pleased to hear from you. Special thanks to Warren Ide for saving these historic photographs and for sharing them with us. All of the images below are linked to larger versions. The scans are taken from prints which are 9 inches square. To preserve as much detail as possible, the images are presented in the highest resolution available to the webmaster, so some scrolling will be necessary. All are presented with Botany Bay at the bottom of the image. On the larger images, the location of Adastra's hangar has been marked with a red dot. Readers requiring aerial photographs of other areas of Australia should visit the website of United Photo & Graphics. This organisation has been contracted by Geoscience Australia to preserve and make available aerial photography from numerous Australian agencies.